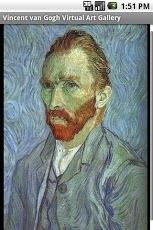 High quality virtual art gallery of more than forty works of Vincent van Gogh. 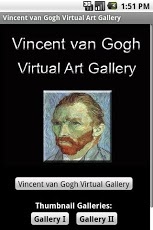 The Vincent van Gogh Virtual Art Gallery brings the artworks of one of the greatest artists in history to your mobile device. The Vincent van Gogh Virtual Art Gallery features more than forty high quality renderings of his works with two different modes. Highly recommended for fans of Vincent van Gogh, and all art lovers.